Candide is the story of a gentle man who, though pummeled and slapped in every direction by fate, clings desperately to the belief that he lives in the best of all possible worlds. On the surface a witty, bantering tale, this eighteenth-century classic is actually a savage, satiric thrust at the philosophical optimism that proclaims that all disaster and human suffering is part of a benevolent cosmic plan. Fast, funny, often outrageous, the French philosopher's immortal narrative takes Candide around the world to discover that -- contrary to the teachings of his distringuished tutor Dr. Pangloss -- all is not always for the best. 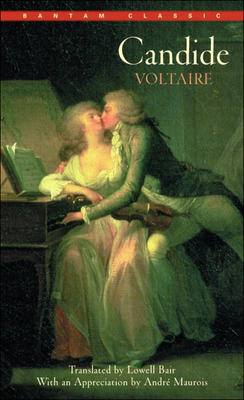 Alive with wit, brilliance, and graceful storytelling, Candide has become Voltaire's most celebrated work.